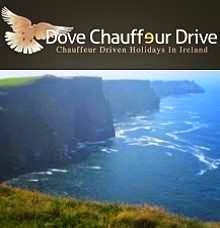 HOLIDAYS in IRELAND: Chauffeurdrive tour for Loren and Kevin on Wild Atlantic Way. Chauffeurdrive tour for Loren and Kevin on Wild Atlantic Way. Loren and Kevin Crowley arrived in Galway today to begin their tour of some of the Wild Atlantic beauty spots over the next few days. The weather was really nice, cool but refreshing, but nice dry healthy weather. We began by taking in some of the sights in Galway city. I took them out to Salthill on the seafront in Galway, the area where i was born and reared, and spent all of my school years. Here we have Loren and Kevin, pictured together at the end of the Salthill promenade, where i swam with all of my pals in my younger years. The diving tower in the background was a favourite of mine. Loren and Kevin with the beach in the background. My happy couple, with the famous notorious Lynch's window in the background. This was the window from which the city's Magistrate hung his own son after finding him guilty of murder, when nobody else would carry out the hanging. They say that it is because of this that the word "Lynching" was derived. On leaving Galway, we made our way to the lovely little town of Kinvara, where they will be staying tonight, before making our way to the Cliffs of Moher tomorrow, and then on to Killarney. The castle in the background is Dun Guaire, the fort of the famous King Guaire. Well, here i am myself with Kevin. That sweater makes me look a little overweight, but take it from me, it is just that sweater. Same here, but i am sure that you will be looking at Loren more than at me. Kinvara has its own cosy little harbour, and here once again we have Kevin and Loren. You can make out the Dun Guaire castle in the distance to Kevin's right. They are a handsome couple, aren't they. A different angle at the same spot, showing some of the old boats. This was a lovely introduction to this really nice young couple today, and i am sure that they will be most pleasant to be with over the next few days. Make sure to come along with us as we make our way along the Wild Atlantic Way.